The 1837 ban on covered heads hasn't been enforced on religious headwear in recent times, but the proposed amendment would create an explicit exemption. WASHINGTON — Newly empowered Democrats plan to let lawmakers wear religious head coverings on the House floor by creating an exception to a hat ban that has existed since 1837 — when there was reportedly very little debate before the enactment of a rule prohibiting what one member then described as the “really harmless but apparently indecorous practice” of indoor hat-wearing. 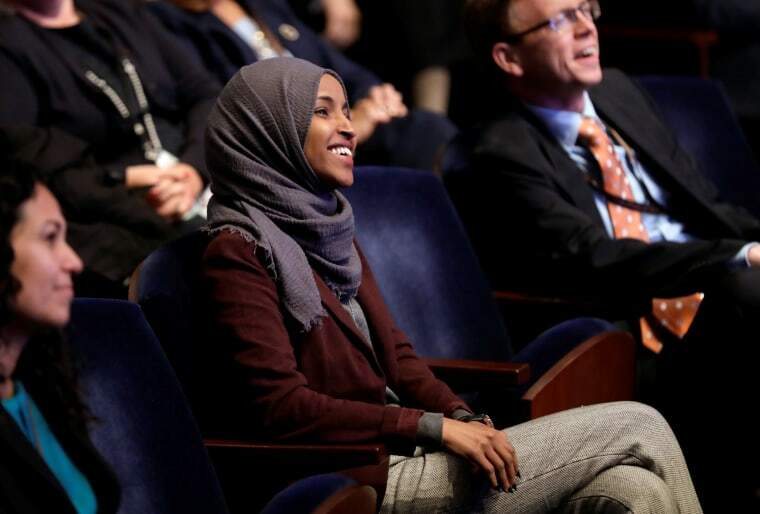 In recent years, the rule hasn't been enforced to preclude members, staff or religious leaders from wearing head coverings on the floor, but the victory of Minnesota Rep.-elect Ilhan Omar, a Muslim who wears a headscarf, has put a spotlight on its continued existence. "Democrats know that our strength lies in our diversity, regardless of race, gender, sexual orientation or religion,” said House Minority Leader Nancy Pelosi, D-Calif., in a statement to NBC News. “After voters elected the most diverse Congress in history, clarifying the antiquated rule banning headwear will further show the remarkable progress we have made as a nation." "This change will finally codify that no restriction may be placed on a member’s ability to do the job they were elected to do simply because of their faith," said incoming House Rules Committee Chairman Jim McGovern, D-Mass., who is working on the amendment with Omar and Pelosi. "The American people just elected the most diverse Congress in history and our rules should embody that." "No one puts a scarf on my head but me. It’s my choice — one protected by the First Amendment," she wrote on Twitter. "And this is not the last ban I’m going to work to lift." In this month's midterm elections, Omar and Michigan Rep.-elect Rashida Tlaib, a fellow Democrat, became the first two Muslim women to win House seats. Tlaib does not wear a headscarf. Omar has been subjected to false claims about her views. One post earlier this month, which went viral on Facebook, included a fake quote — "I think all white men should be put in chains as slaves because they will never submit to Islam" — attributed to Omar and printed with her image. Politifact rated it "pants on fire" because it was entirely made up. Diversity of religious practice is, of course, nothing new to Congress. A little more than half of the members of the current Congress identify as Protestant Christians, according to a Congressional Research Service report based on data compiled by Congressional Quarterly and Pew Research Center. Nearly one-third identified as Catholic at the start of this Congress in January 2015. There were 30 Jewish members of the House and Senate at that time, with Buddhists, Muslims and members of the Church of Jesus Christ of the Latter-Day Saints accounting for some of the other religions represented on Capitol Hill. At times, religious and political imperatives have come into conflict for lawmakers. The Rev. Robert Drinan, a Democrat who represented a House district in Massachusetts from 1971 to 1981, gave up his seat after Pope John Paul II decreed that priests could not hold elective office. Drinan didn't wear a hat on the House floor but he was never without his Roman collar. Pelosi later noted that the pope's order resulted in the district electing Barney Frank — who is gay and Jewish — to succeed Drinan. None of the current Jewish members of the House wear yarmulkes on the House floor or during their daily work activities. But some staff aides do wear religious headwear there, and Pope Francis wore his skullcap when he addressed a joint session of Congress in 2015. Shortly after the Sept. 11, 2001, terrorist attacks, Rep. Carolyn Maloney, D-N.Y., wore a full burqa — which covered her head, face and body — during a House floor speech. The responsibility for enforcing the House dress code, which includes coats and ties for men, falls on the speaker of the House. Since Democrats will be in control of the chamber in January, it would be up to theie leader to choose whether to ban or permit religious headwear. But by enshrining the exemption in the House rules, Democrats may make it harder politically for future Congresses to eliminate it. A spokesman for House Majority Leader Kevin McCarthy of California, who was elected to lead the GOP in the next Congress, did not immediately reply to NBC's request for comment on the proposal.